The awards ceremony included awards by campus organizations like SAB, ASUWT, The Ledger, and Taho­ma West. In addition, student nomina­tions were considered for the student’s choice awards and several others. The student’s choice categories in­cluded the awards for Outstanding Staff, Outstanding Faculty, Outstanding Student Leader, and Campus Impact. The Outstanding Staff award was pre­sented to the entire staff of the Nursing and Healthcare Leadership Program. Several staff members accepted the award and received a loud round of applause. The Outstanding Faculty award was presented to Christine Stevens, RN, Ph.D. who is an associate professor in Nursing and Healthcare Leadership. Her scholarly interests include adoles­cent health, homeless healthcare, and food insecurity among adolescent populations. Stevens was also the re­cipient of the Distinguished Teaching Award in 2012. The Black Student Union won the award for Campus Impact. The Black Student Union aims “to offer a sense of community and unity for Black stu­dents on campus by providing an open and positive forum for students to ex­press their views concerning current events, academics, culture, and student life.” In addition, the Black Student Union has been a visible and vocal pres­ence on campus in support of the na­tionwide Black Lives Matter movement. Dean of Student Engagement, Ed Mirecki also presented a new award at this year’s Oscars. 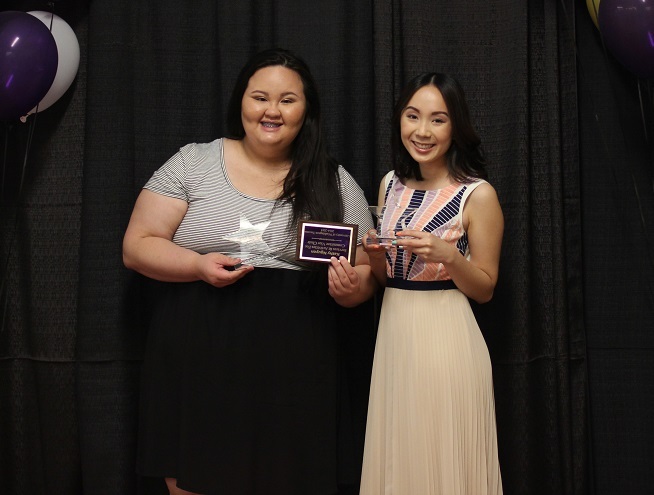 Mirecki presented the Dean’s Leadership Award to sev­eral students who exhibited an ongoing commitment to leadership in student organizations on the UW Tacoma cam­pus. Awardees received a medal from the Dean and included The Ledger editor-in-chief, Eva Revear and Taho­ma West editor-in-chief, Nicole Mc­Carthy. The final award of the night went to Top Dawg, Kathy Nguyen. Con­gratulations to Kathy Nguyen and all the award winners and nominees of the 2015 Oscars.